Headquartered in Denver, Colorado, AutoAuto Wash (AAW) is a full line car wash service, sales and supply company representing a wide range of vehicle wash equipment and chemicals. AAW began in 1999 as an operator of car washes with 49 in-bay automatics in Colorado, New Mexico and Oklahoma. In 2004 AAW expanded their reach by taking all service and chemicals supply in-house for their car washes and began servicing and providing chemicals to non-AAW operated car washes. In 2005 AAW became a full line distributor of in-bay car wash equipment and distributor of main line chemical manufacturers. In 2008 AAW broadened their reach into commercial truck/bus washing and began supplying equipment, service and chemicals to municipalities and the USPS. Today AAW services more than 150 vehicle wash locations throughout Colorado (and a few in Wyoming) providing 24/7 service every day of the year complemented by a route based chemical delivery schedule ensuring all customers are kept full and operating at optimal levels at all times. AAW understands the value of positioning service technicians within geographic proximity to customers and has strategically placed factory certified field technicians stretching from Pueblo to Fort Collins as well as the Western Slope. The service department prides itself on providing the highest quality service on all brands of vehicle wash equipment in the AAW sales portfolio in addition to servicing and offering superior or comparable parts on all competitive brands of equipment such as: PDQ, Mark VII, Ryko, Belanger, McNeil, InterClean, Karcher, Istobul, Sonny’s and many more. 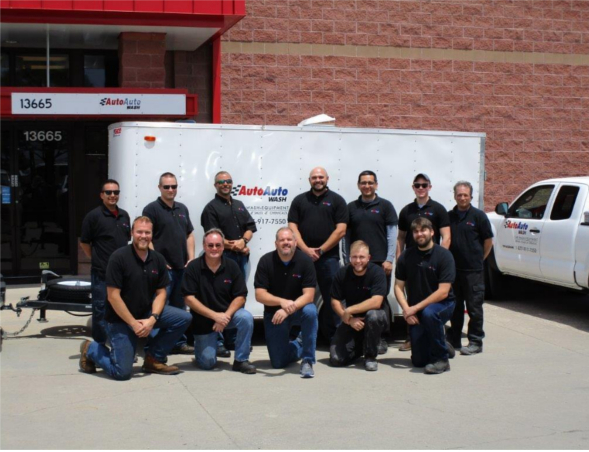 All service technicians are API safety certified to ensure the protection of our most valuable assets: our team members. AutoAuto Wash management rigorously endorses a zero tolerance policy as it relates to safety procedures. AAW maintains a fully stocked warehouses in both Denver and Grand Junction along with dedicated chemical delivery vehicles and staff. Phones are manned 24/7 fielding service calls and general inquiries every day of the year. Technicians are dispatched within minutes of receiving service requests from customers via a central dispatching system. All trucks are equipped with GPS tracking devices to aid in most efficient and cost effective dispatching.